It's the most wonderful time of the year... unless you're a syndicated game show. On Christmas Day, NBC and ABC will be airing sports in place of Wheel in many areas. CBS and FOX are safe. 7:00 ET/6:00 CT airings of Wheel of Fortune on NBC affiliates will be pre-empted and potentially 7:30 ET/6:30 CT airings as well if the scheduled NFL game ends late. NBC has PIT @ HOU scheduled for 4:00-7:30 PM Eastern. Note that some stations that have Jeopardy! normally scheduled during the game might also move it to the 7:30/6:30 slot in place of Wheel, as several stations give it priority because of its continuity with returning champions. 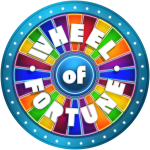 Wheel of Fortune will be pre-empted on all ABC affiliates, except for 7:30 PM Pacific airings if the final NBA game ends on time. ABC is pre-empting all programming from 2:00-10:30 PM Eastern with a half-hour holiday special of The Chew followed by an NBA pregame show and a triple-header, scheduled from 3:00-5:30 (CLE @ GSW), 5:30-8:00 (WAS @ BOS), and 8:00-10:30 (HOU @ OKC). ABC has no national primetime schedule for Christmas Day because of the games ending shortly before the 11:00 news leading into Jimmy Kimmel Live!. In the Eastern and Central time zones, ABC is giving the vacant 10:30 ET/9:30 CT slot to a special half-hour edition of The $100,000 Pyramid. It will also be airing in the Mountain Time Zone at 8:30 MT immediately after the games, though airings on Pacific stations vary; some don't have it scheduled at all. In the Mountain and Pacific Time Zones, ABC affiliates are given the vacant primetime slots to schedule whatever they please. Most stations are filling them with local specials, Pyramid at varying times, a holiday episode of 20/20, or delayed airings of pre-empted syndicated shows, including Wheel. This Christmas, check your local listings to see if Wheel is getting moved to a later time or an alternate station; the rescheduling varies greatly, especially if you're in the West. Also keep in mind that if Wheel gets pre-empted completely on Christmas Day, your station might air the week's episodes one day behind to compensate, with Friday airing on Saturday. Nice!!! does this also apply for my friends on East Coast regarding A possible ''Friday airing on Saturday''?. Locally I get Wheel on KABC 7, amd i also have Wheel on WABC. More bad news for game show fans - the half-hour edition of Pyramid that ABC had initially scheduled as post-game filler has been replaced with a rerun of blackish. The same show has also replaced the pre-game holiday special of The Chew, likely because it was from before Mario Batali got fired. West Palm Beach WPBF 5:00PM ET Sat. *In Jacksonville, Wheel normally airs on WTLV (NBC) at 7:00PM ET. When it gets pre-empted, it is moved to sister station WJXX (ABC). Since its alternate station is also pre-empted, Wheel will not be seen in Jacksonville tonight. The West Coast airings are probably the closest thing we'll ever get to a primetime edition of Wheel. Football ended at 7:29 and postgame coverage continued into the 7:30 timeslot. NBC joined regular programming in progress at 7:42. Wheel started mid-Round 2. The final NBA game ended at 10:24, postgame ran a little bit late. ABC joined regular programming (blackish for everywhere except the West Coast) in progress at 10:32. If you were pre-empted tonight and you see these players tomorrow, then your station will be airing Wheel on a one-day delay this week. WPVI in Philadelphia is airing Wheel a day behind to make up for the pre-emption. They aired Bill/Patti/Andi tonight. Presumably, they'll be showing Friday's episode on Saturday instead of the scheduled rerun from last season's Weekend Getaways week (Jahneille/Teri/Arnie). WABC in New York and pretty much everyone else is airing the week as-is. Thank you Robert for helping me get a copy of the show. I sent a link to my sister who lives outside Philadelphia thinking that would be the only way my mom could see my show the next time they got together. I had spoken to WPVI a couple weeks before the airing and they had no plans to air it at that time. My mom was so excited when she tuned into the Wheel on the 26th - and there I was. ...and as for my home station WPBF, after all the back and forth inquiring and begging, they finally change their "Not Airing" position and don't have the decency to let me know. I only found out through you. Thank you again. No problem, Bill! It's always good to double-check. Lucky WPBF's listings listed the episode explicitly, too. Sometimes, they'll just do the make-up airing on a whim when another show is listed, and WPVI's listings still show the Tues-Sat shows on their usual dates instead of adjusting it to show Mon-Fri. Other stations that do make-up airings on Saturday often show two airings of the Saturday rerun in their listings. I think it's convenient that your home market is airing the episode on a Saturday evening. Would be great for a viewing party, if only you had more advance notice.